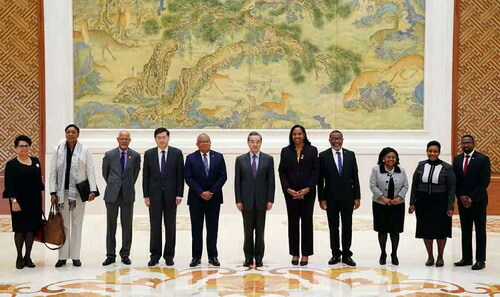 On February 21, 2019, State Councilor and Foreign Minister Wang Yi met in Beijing with representatives of the Caribbean side who were here for the seventh round of consultations between the Ministry of Foreign Affairs of China and the Ministries of Foreign Affairs of the Caribbean countries having diplomatic relations with China. Wang Yi congratulated on the success of the consultations between the Ministry of Foreign Affairs of China and the Ministries of Foreign Affairs of the Caribbean countries which have diplomatic relations with China. Wang Yi said that China and the countries in the Caribbean region always respect each other and treat each other as equals. Bilateral relations have become a model of equal co-existence, mutual benefit and win-win results between big and small countries. During the consultations, the two sides reached new important consensus on how to further strengthen China-Latin America relations, which has enhanced mutual trust and also injected new impetus into future mutually beneficial cooperation. Wang Yi made a-four point proposal on the development of the relations between China and the Caribbean countries. First, we should jointly uphold the basic norms governing international relations, strengthen solidarity and coordination, earnestly uphold the international system with the United Nations at its core, and uphold multilateralism based on international rules. Second, we should work together to promote sustainable development. The Chinese side is ready to help the countries in the Caribbean region cope with climate change and other challenges within the framework of South-South cooperation. Third, we should strengthen cooperation under the Belt and Road Initiative. It is hoped that the Caribbean countries will become strong partners in jointly building the Belt and Road Initiative and enhance their capacity for independent development and accelerate their industrialization process through jointly building the Belt and Road Initiative. Fourth, we should jointly uphold international and regional peace and stability. Wang Yi pointed out that the Venezuelan issue is essentially Venezuela's internal affairs. The Chinese side follows the basic norms governing international relations and adheres to not interfering in the internal affairs of other countries. We hope to promote peace talks among all parties to promote the Venezuelan people to solve the issue peacefully through dialogue and consultation within the framework of the constitution, and maintain national stability and development. It is not only in Venezuela's own interests, but also conforms to the common interests of all countries including the countries in the Caribbean region. The Commonwealth of Dominica is the rotating coordinator of the Caribbean side. Minister of Foreign and CARICOM Affairs Francine Baron of the Commonwealth of Dominica and representatives of the Caribbean side expressed that during this visit, we witnessed China's great development achievements under the leadership of President Xi Jinping and the Communist Party of China, and hoped to learn from China's successful experience. China is a good friend of the countries in the Caribbean region and has always offered sincere help and support to the countries in the region in their development. Attaching great importance to developing relations with China, the Caribbean side will continue to firmly adhere to the one-China policy. The Belt and Road Initiative put forward by President Xi Jinping is visionary and offers major opportunities for countries in the region to enhance connectivity and realize their own development. The Caribbean side is ready to work with the Chinese side to jointly build the Belt and Road Initiative, intensify communication and coordination on climate change and other issues and safeguard the common interests of both sides. On the Venezuelan issue, the Caribbean countries share similar positions with the Chinese side and are ready to work with the Chinese side to promote peace talks.